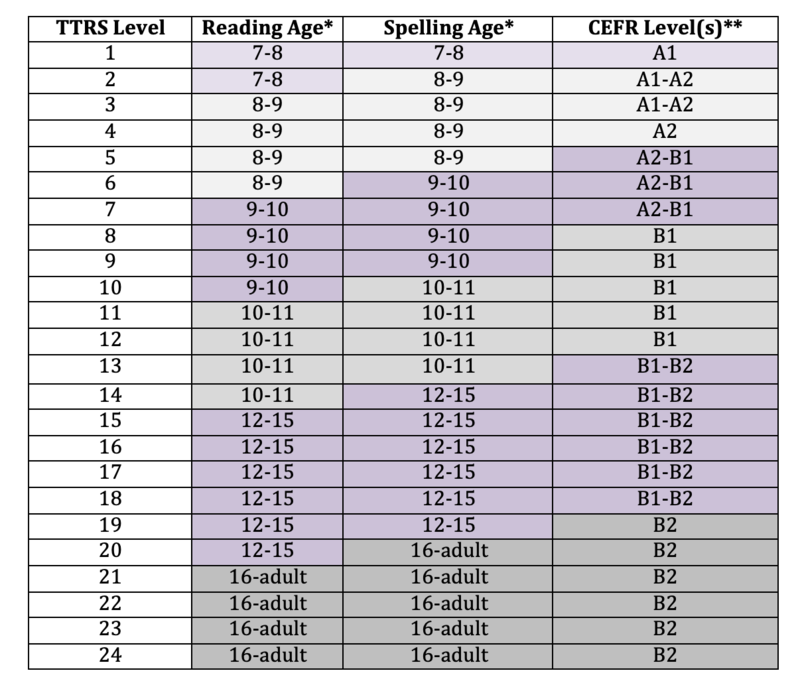 *Note, the recommended age and CEFR figures describe the majority of terms found in each TTRS level. As TTRS is a typing programme, levels also practice vocabulary from earlier levels and contain words designed to support correct finger placement and keyboard navigation. The latter may or may not be of a specific CEFR or frequency level. **This research report has made use of the English Vocabulary Profile. This resource is based on extensive research using the Cambridge Learner Corpus and is part of the English Profile programme, which aims to provide evidence about language use that helps to produce better language teaching materials. See http://www.englishprofile.org for more information. 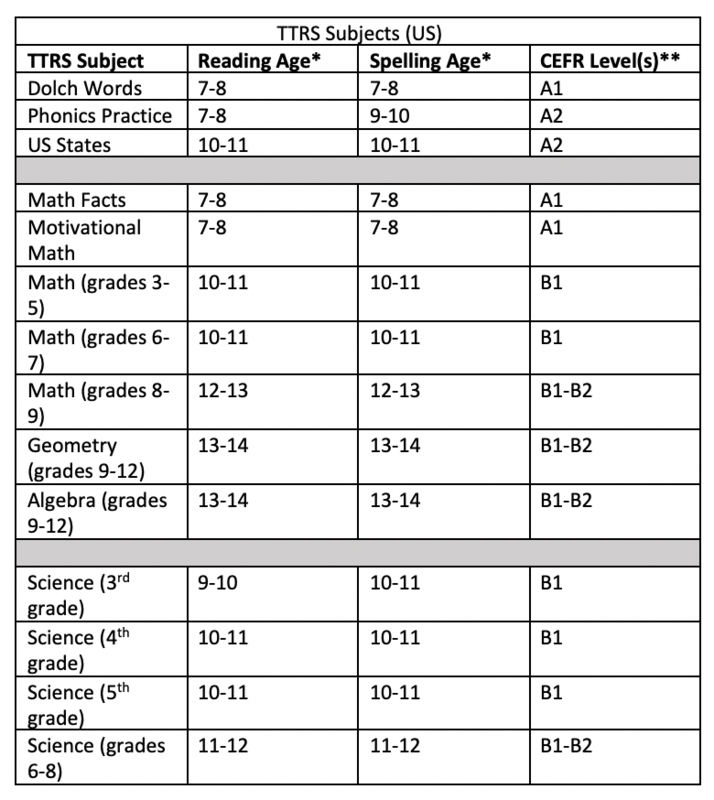 This document represents the results of a comparative study of the Touch-type Read and Spell course with various academics guidelines for reading, spelling and English language instruction. 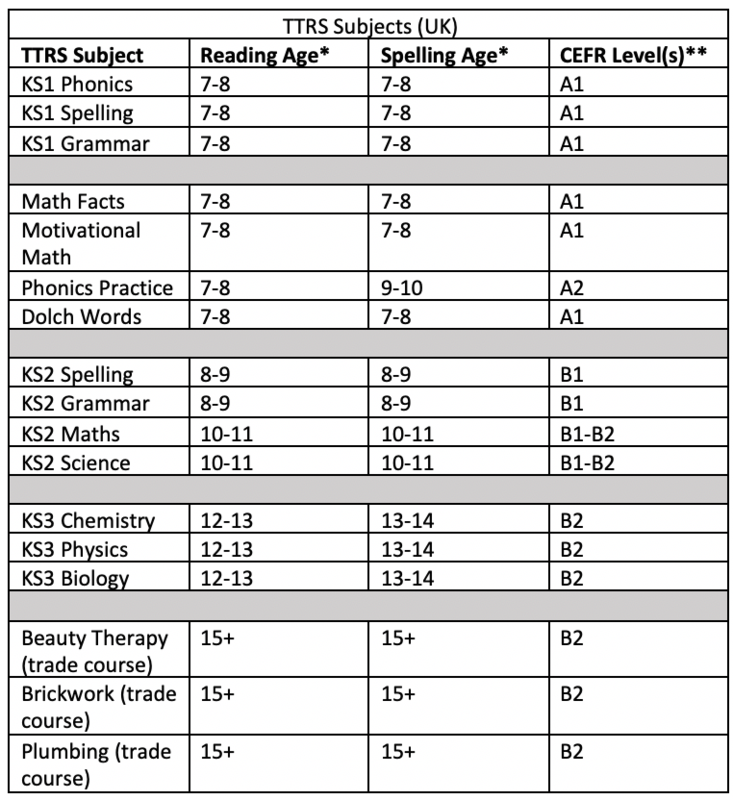 The approximated age and level recommendations that appear in the table factor in word frequency and vocabulary inclusion from standard curriculums including the The Basic Spelling Vocabulary List (Graham, S. etc. ), US Common Core Academic Vocabulary List and Sight Words from the Dolch list and Dolch Noun List. English language levels use the Common European Framework of Reference (CEFR) scale in which A1 indicates beginner, A2 advanced beginner, B1 low-intermediate, B2 upper-intermediate, C1 advanced and C2 proficiency level. Course words were assigned a value based on their inclusion in the Cambridge English Corpus, a multi-billion word corpus of spoken and written English that includes both US and UK sources, and the Cambridge Learner Corpus (CLC) a collection of examination scripts from language learners. Whenever possible, the TTRS course adheres to recommended character length and language complexity for beginner readers and can be used to reinforce phonics work for literacy skills instruction. Additionally, lexical features such as practice with English affixes and suffixes have been included throughout the levels. The course further contains a variety of common English names, in addition to country names and nationalities. Cambridge English Corpus. Cambridge University Press, 2016. Cambridge Learner Corpus. Cambridge University Press, 2016. Common Core State Standards Initiative. National Governor’s Association Center for Best Practices, Council of Chief State School Officers, 2010. Common European Framework of Reference for Languages: Learning, Teaching, Assessment. Council of Europe, 2011. Dolch, E.W. (1942). The Dolch basic sight wordtest. Champaign IL: Garrard. Nagy, W. (2005). Why vocabulary instruction needs to be long-term and comprehensive. Teaching and learning vocabulary: Bringing research to practice (pp. 27–44). Mahwah, NJ: Lawrence Erlbaum.